Dancing in the Streets ($20 – Click to Order on Amazon, or buy for $2.99 on Kindle; ISBN: 978-1-937536-11-4, Hardcover ISBN: 978-1-68114-168-8, LCCN: 2011960762. 2011. 6X9”. 208pp. ): Now and then, you still can see the tattered remains of a bumper sticker exclaiming: “If you remember the ’60s, you weren’t there!” But Steven P. Unger is an exception to the rule—he took notes. As a result, his novel Dancing in the Streets is replete with unforgotten and unforgettable images of events and scenes that have long been lost in a smoke-filled haze. From the Merry Pranksters’ Wavy Gravy teaching breathing lessons outside Nixon’s first Inaugural Ball to a near-fatal encounter with Charles de Gaulle’s Republican Guard in Paris, there are compelling scenes from beginning to end no less cinematically vivid for the fact that they’re real. 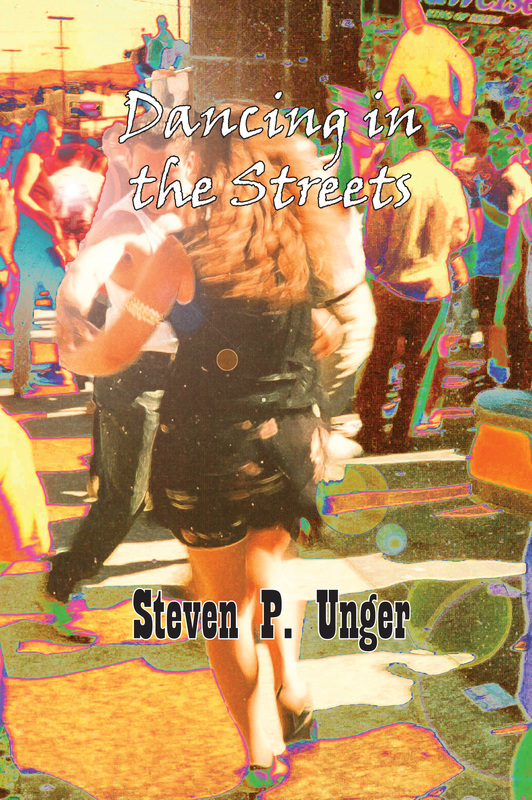 And while the story-chapters of Dancing in the Streets have more than just a ring of truth to them along with generous helpings of riotous comedy, there is also a compelling mystery haunting Unger’s alter ego, Steven Strazza: a deathbed revelation that leads to the discovery of long-buried secrets of murders affecting families on three different continents. Steven P. Unger’s first book was, In the Footsteps of Dracula: A Personal Journey and Travel Guide, 2nd Edition (http://worldaudience.powweb.com/pubs_bks/Dracula.html). He also wrote the accompanying text and Preface for Before the Paparazzi: Fifty Years of Extraordinary Photographs (www.beforethepaparazzi.com), which includes over 250 pictures taken by Arty Pomerantz, staff photographer and assignment editor for the New York Post from the 1960s through the early 1990s. Steven P. Unger lives in Elk Grove, California with his fiancée Paula.